Beachcomber Guest House01263 513398work Guest HouseCromer Beachcomber Guest house is a great place for a peaceful stay. We are a friendly guest house. We are situated near the seafront, a few minutes’ walk from the town centre, station and bus station. There is a guest lounge. Street parking is free. There are also several car parks close by where there is free parking from 6pm to 8am. We serve a varied English breakfast and cater for food intolerance. There are 5 ensuite bedrooms, sleeping 11. A ground floor flat is available with its own lounge, kitchen/diner and low entry shower room for those who prefer the ground floor and you can still enjoy our breakfasts. There is cycle storage available. Beachcomber Guest House sometimes limits bookings to 3 or more days. Comfortable room with a small seating area. 6 Rock Pools sometimes limits bookings to 3 or more days. This room is on the second floor. It has a side sea view and can accommodate a family of four. 7 Crab Pots sometimes limits bookings to 3 or more days. 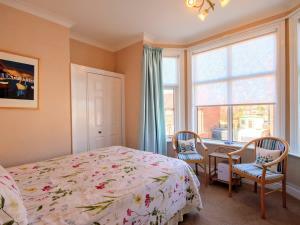 Cromer Beachcomber Guest house is a great place for a peaceful stay. We are a friendly guest house. We are situated near the seafront, a few minutes’ walk from the town centre, station and bus station. There is a guest lounge. Street parking is free. There are also several car parks close by where there is free parking from 6pm to 8am. TV and wifi in roooms Children welcome from any age. Runton Road (Cromer-Sheringham), turn at Sandcliffe Hotel, first guesthouse nearest sea and on the left. By rail: Cromer station is a five minute walk away.